G&W EXPECTS COMBINATION THE P&W WILL REALIZE SUBSTANTIAL IMMEDIATE COST SAVINGS: “Our acquisition of the P&W will ultimately enhance the efficiency and customer service of rail in New England,” said CEO Jack Hellmann. Combination of two smaller northeast railroads. P&W serves aggregates, auto, chemicals, metals, and lumber customers. P&W handles 43,000 carloads and intermodal units annually. Genesee & Wyoming Inc. has announced today that it will acquire Providence and Worcester Railroad Company for $126 million. The acquisition is expected to close in the fourth quarter of 2016. Headquartered in Worcester, Massachusetts, and operating in Rhode Island, Massachusetts, Connecticut, and New York, P&W is contiguous with G&W’s New England Central Railroad (NECR) and Connecticut Southern Railroad (CSO). Rail service is provided by approximately 140 P&W employees with 32 locomotives across 163 miles of owned track and over approximately 350 miles under track access agreements. These include exclusive freight access over Amtrak’s Northeast Corridor between New Haven, Connecticut, and Providence, Rhode Island, and trackage rights over Metro-North Commuter Railroad, Amtrak, and CSX Corp. between New Haven, Connecticut, and Queens, New York. P&W interchanges with G&W’s NECR and CSO railroads, as well as with CSX, Norfolk Southern, Pan Am Railways, Pan Am Southern, the Housatonic Railroad and the New York and Atlantic Railroad, and also connects to Canadian National (CNI) and Canadian Pacific (CP) via NECR. P&W serves a diverse mix of aggregates, auto, chemicals, metals, and lumber customers in southeastern New England, handling approximately 43,000 carloads and intermodal units annually. 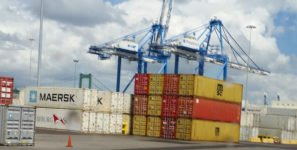 In addition, P&W provides rail service to three ports—Providence, Davisville and New Haven—and to a U.S. Customs bonded intermodal terminal in Worcester, Massachusetts, that receives inbound intermodal containers for distribution in New England. P&W also owns approximately 45 acres of undeveloped waterfront land in East Providence, Rhode Island, that was initially envisioned as a deep water, rail-served port through a $12 million investment. G&W expects to sell this undeveloped land. Upon approval by the Surface Transportation Board, P&W would be managed as part of G&W’s northeast region. The addition of P&W to G&W’s existing presence in the region substantially enhances G&W’s ability to serve customers and Class I partners in New England, which is a highly competitive rail market with a premium placed on timely, efficient, and safe rail service. The acquisition is anticipated to unlock significant cost savings through overhead, operational, and long-term network efficiencies as well as to generate significant new commercial opportunities.